Start off the month of fun with a contest! A ‘Why I Love the Bookstore’ promotion is the perfect opportunity to increase interaction with your students while you gain free publicity! 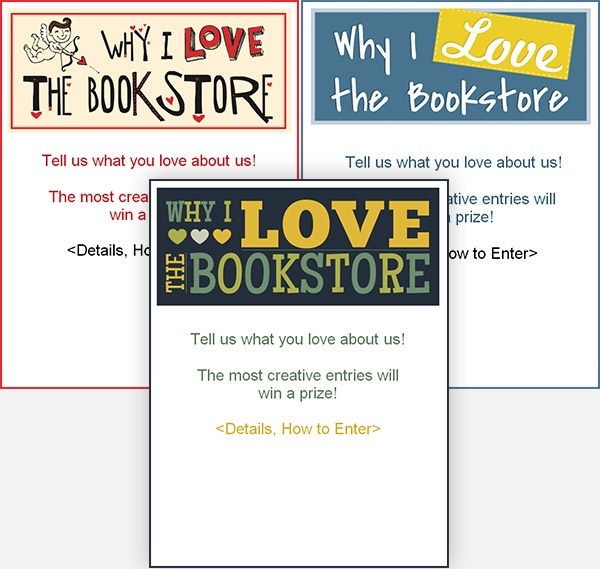 Have students submit the reason they love your store and award prizes to the most creative responses. As always, start with the planning phase by choosing a submission method. Consider having students post responses to your Facebook Wall, submit a photo or even create a video illustrating their reason. If you’re worried about inappropriate entries, have students send their response to a designated email address so you can screen entries before posting. Regardless of which method you choose, we recommend posting entries to your social media sites at some point during the contest for added publicity. Next, decide how you’ll choose a winner. Votes can be collected and tabulated by asking students to simply select their favorite entry using a contest application, such as Offerpop, on Facebook or retweet (RT) the name of the photo or video on Twitter. This strategy creates a simple way to get everyone involved in the process and increase the amount of votes. Then, set the deadline, outline guidelines for submission and choose prizes! Partner with local businesses to offer fun prizes that students can use on Valentine’s Day such as gift certificates to the movies or a gift basket of assorted valentine-themed merchandise. Finally, promote the event and watch the entries start pouring in! Be sure to reward your winners publicly and thank all participants for their responses at the end of the contest! The students have shown their love for the store — now it’s your turn! Enhance loyalty even further by running a ‘Why We Love Our Students’ promotion. Start by creating posters to decorate the store and spread the feeling of goodwill. Using one of the templates below, add in reasons why the students on your campus are special and hang them throughout the store. We've included samples in our templates to spark your creativity, but feel free to add in your own. While the posters target in-store students, reach out to the rest of your student body on social media. Use one of the reasons from your posters as your status update or tweet each day to promote your campaign on social media. Tag your school’s Facebook or Twitter page using the @ symbol to spread your appreciation to students who may not know your store has a page. You may even gain some new fans! For example, you would post: We love @MBS University students because they cheer louder than any other fans! Along with these decorations, highlight a variety of student employees or customers each day of the week to show your appreciation for their continued business. Compile their picture, a short-bio and one reason your store thinks they’re great and share it via a social media post or in-store poster. Consider featuring students who are making a difference on campus or are dedicated customers at the store. 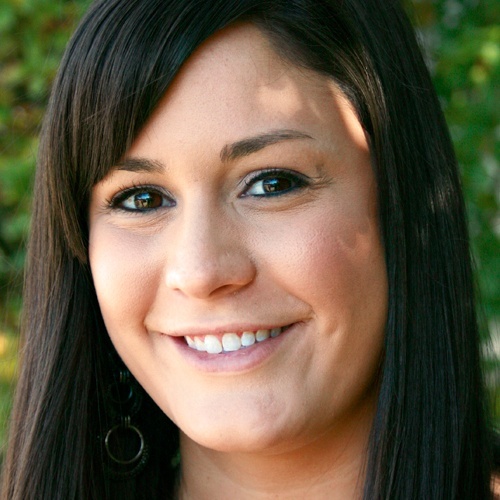 Close out your promotion with a bang! You’ve told students why you love them, and this event allows you to show them. Host an in-store Student Appreciation Day on or around Valentine’s Day to drive traffic, and again, increase loyalty. 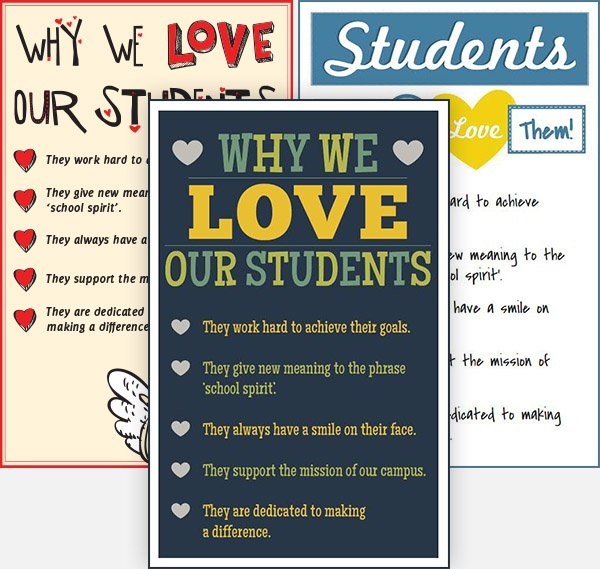 Be sure to continue displaying the posters you created with the reasons you love your students throughout the event. Create a station where students can decorate handmade paper hearts to dedicate and inscribe to a friend, relative or that special someone. Supply construction paper, markers and any other craft supplies you choose for this fun activity. Then, allow students to ‘Put Their Love on Display’ by hanging their decorated hearts in your bookstore’s front window for $1 donation. Post details explaining how students can donate near the station, at the register, as well as online to advertise this option. Hang one giant heart in the center of the display dedicated to all your students from the bookstore. Donate the proceeds from the promotion to a cause such as the American Heart Association or any other charity you choose. Provide heart-shaped cookies and other themed refreshments near your more popular displays to gain extra attention, and offer sales on Valentine’s Day merchandise or items of your choice.